The steroid injected reduces the inflammation and swelling of tissues around the occipital nerves. This may in turn reduce pain and other symptoms caused by inflammation or irritation of the nerves and surrounding structures. 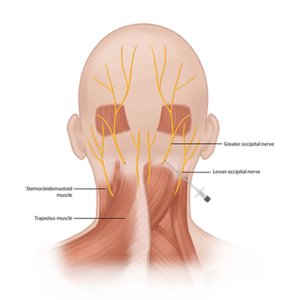 Typically, headaches over the back of the head, including certain types of tension headaches and migraine headaches, may respond to occipital nerve blocks. The actual injection takes only a few minutes. It is done with the patient seated or lying down. The skin and hair of the back of the head are cleaned with antiseptic solution and the injection is carried out.